The launch of branded collections, development of self-purchase trends and collaboration of trade initiatives are fuelling platinum jewelry retail growth in 2018.
â€œWe see new segments are being further developed beyond bridal, and branded collections generate higher margins for the trade by better meeting consumersâ€™ needs. Competitive platinum prices, differentiated product offering and effective marketing are making platinum more accessible and more desirable,â€� says CEO Huw Daniel of PGI. According to the latest Platinum Jewelry Business Review, being the third largest platinum jewelry market, platinum jewelry demand of trade partners in the USA achieved strong growth of 18% for the third quarter compared to a year ago. According to the latest PGI Insight report, weddings continue to drive US platinum jewelry demand, and 24% of US consumers prefer platinum setting for a diamond ring due to its strength, never fading color and quality to hold a diamond more securely. 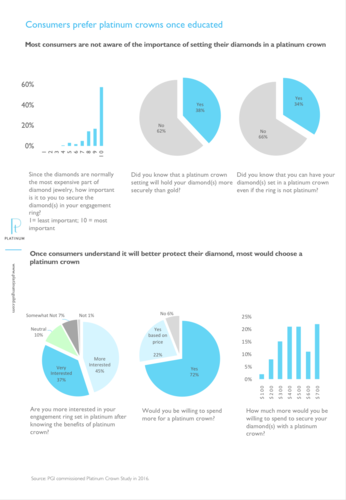 Once educated, most consumers are willing to choose platinum for their diamond jewelry even at higher costs. Trade education and collaboration with strategic partners helped generate a 10% increase in platinum sales as of Q3 2018. The consistently lower price of platinum supported by strong retail consumption and positive trade sentiment has opened up new opportunities in the USA beyond the wedding industry. Growing economic power and newly introduced branded collections have encouraged women to purchase jewelry made of the premium metal to celebrate meaningful moments of everyday life. For more information, please download the latest Platinum Business Jewelry Review here: http://platinumguild.com/research-publications/platinum-jewellery-business-review/; and the PGI Insight November 2018 report on US market here: http://platinumguild.com/research-publications/pgi-insight/.